I was lucky enough to grow up in the pre-Barbie Doll Dream House era. While my sisters and I had Barbies (and Midges, Kens and Skippers) and were card-carrying members of the Barbie Doll Fan Club, the Dream House had not yet been introduced. That didn’t stop us. Using placemats as carpeting, napkins as bed linens for shoe box beds, and ashtrays as cunning end tables, we created a Barbie mansion to rival anything Mattel could produce. It was magnificent, and even more incredible was the mess we made. Of course we were told by our mother, in no uncertain terms, to put everything back “the way we found it.” I’m pretty sure nothing was returned “exactly” as we found it…still; we were allowed to make the mess. 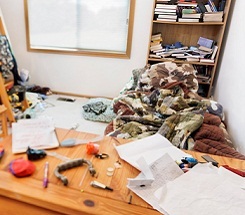 Conduct an informal survey the next time an adult claims, “I’m not creative.” Chances are they grew up in a home where they weren’t allowed to make a mess. While I take issue with anyone who claims they have no creativity (impossible!) I have met people with an unfortunate disparity of the trait. If there was ever an argument of nurture vs. nature when if comes to raising our children, instilling creativity is a trait we can nurture. The first step? Let them make a mess. There is a core value system to this philosophy: people first, animals next, things last. When “things” is first on your list of priorities it is difficult to stand by while your son is turning your couch into a garbage truck. I’m not saying we can’t have nice things or suggesting kids don’t have to clean up after themselves. What I am saying is that having a constant rule for tidiness is like sticking a child in a playpen. We know playpens shouldn’t be over-used. A habit of neatness can have the same dulling effect on a child’s ability to think big. Another informal survey—this time of kindergarten classes— will expose many five-year-olds having trouble using scissors. Not all, but a good number of these children were probably not allowed to leave the mounds of shredded paper bits a four-year-old creates when you let him use scissors. It is a hideous mess, not to mention incidents of “I cut my own hair mommy!” But these tools of the kindergarten trade– scissors, pencils, crayons, markers, paint, clay– take time to learn to manipulate. These are eye-hand coordination opportunities that can be messy, even lethal to some surfaces, but their use broadens a child’s base of knowledge–this is essential, valuable practice. The ability to think big as an adult, to be an idea person, is a gift that sometimes begins with the freedom to think big as a child. The chance to use all the couch cushions, the kitchen chairs, and every blanket in the linen closet, in order to turn the living room into a fortress, is an unparalleled opportunity to learn engineering strategies, cooperation skills and the priceless ability to gain intrinsic pride from an accomplishment. When play imitates the world, incredible learning occurs, particularly schematic connections as the children explore their environment trying to figure out what could be transformed into the scenario they are creating. Much of the play is simply setting the scene, an operation that often looks to an adult like a major mess, while to the child, the suspension of reality vs. fantasy has created a perfect backdrop for their imagination. After an inspiring tour of a costume shop, my daughter and her friend created a costume shop in the basement, where her cast- off recital costumes were each hung and tagged in a complicated filing system she still laughs about today. Occasionally, we even want to encourage a messy mind. In other words, we want our kids to let their imaginations soar. Brainstorming at the dinner table is a great jumping off point. Letting the entire family come up with ideas for an assignment often gleans ideas both lame and outrageous, but eventually produces the perfectly clever one. We don’t want to put a ceiling on these suggestions—there are no perimeters for brainstorming— it is the process that is fun. It is modeling the ‘many minds make many ideas’ method used in scientific labs and advertising meeting rooms across the country. So the next time you come across an incredible mess your children have made, first revel in their creativity; then make them clean it up!